City Inn’s 40 guest rooms have been stylishly designed to offer a luxurious stay and are combined with a host of extra features to ensure a peaceful night’s sleep in Vientiane. We offer Deluxe, Junior Suite and Executive Suite options to you, and are pleased to provide LED flatscreen televisions, IPod docks, and complementary in-rooms wireless internet, tea/coffees making facilities and safety deposit boxes as standard. With spacious interiors, crisp bed linens and rich, modern designs, we are sure your stay with us will be a thoroughly enjoyable and relaxing one. Whether you wish to completely relax or would prefer to work, our Executive Suite is the highest standard of accommodation, providing ample space and soothing surroundings. 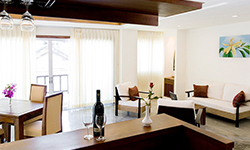 Enjoy our light, calming Junior Suite which offers a tastefully decorated living room and state-of-the-art facilities. Spend the night in a generous Deluxe and unwind with the highest levels of comfort and peace.